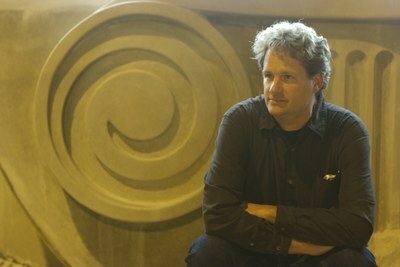 Andrew Redington is a professional artist who specializes in three-dimensional work. He received a Master of Fine Arts degree from the University of Wisconsin where he studied metalsmithing, woodworking, and sculpture. His artistic practice spans the spectrum of scale from bodily adornment to utilitarian design and monumental public sculpture. Andrew is a nationally exhibiting artist with work that was selected for exhibitions ranging from the Carnegie Science Center in Pittsburg, PA, the Union Street Gallery in Chicago, Illinois, and juried corporate sponsored competitions where he received merited awards. Recently his work was accepted into Stephen F. Austin State University Gallery, Nacogdoches, TX and the Members Gallery at the Furniture Society international conference in Port Townsend, WA. He has been a finalist for public works of art and most recently completed a monumental public work for the newly built Thelma Sadofff Center for the Arts in Fond du Lac, WI. Andrew has held a teaching position at the University of Wisconsin, Oshkosh since 1995 where his duties include instructing a variety of 3D, 2D and art appreciation courses and serving seven years as the Director of the Priebe Gallery. His has been involved in a multiplicity of outreach engagements and he has juried regional, professional, and high school exhibitions.